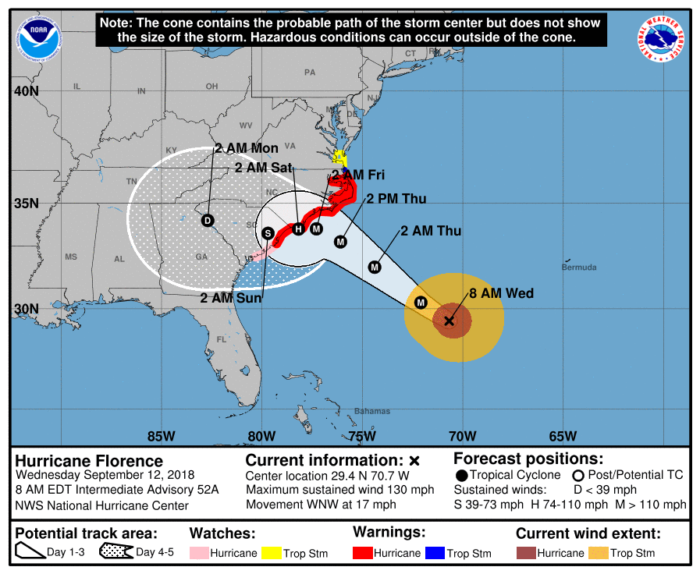 Hurricane Florence remains a category 4 storm Wednesday morning with maximum sustained winds of 130 mph. 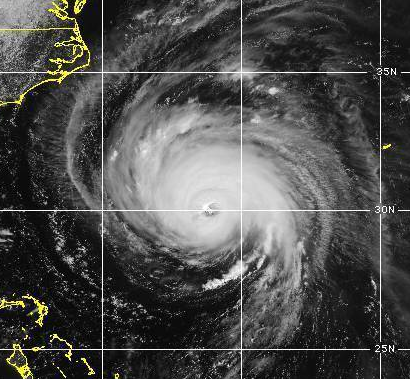 The hurricane is currently just over 500 mi southeast of Cape Fear, NC. A hurricane warning and storm surge warning are in effect from South Santee River, SC to Duck, NC. A hurricane watch is in place from Edisto Beach, SC to South Santee River, SC. Evacuations will continue today in North Carolina and South Carolina. Any preparations need to be completed by the end of today. As Florence nears the coast tomorrow and winds pick up, outdoor work will become too dangerous. Tropical storm force winds could arrive at the Coast as soon as tomorrow morning. Landfall looks to be along the Carolina coast sometime Friday. 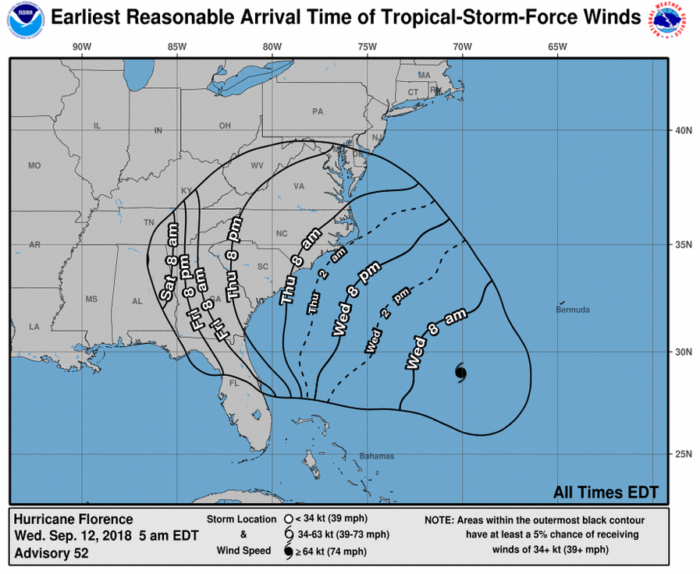 Regardless of where exactly Florence makes landfall, hurricane conditions are expected along the coasts of both states. The primary threats at this time are dangerous storm surge and extreme rainfall and potentially catastrophic flooding. Hurricane force winds and isolated tornadoes are also of concern. If you live in an evacuation zone, heed all evacuation orders and listen closely to directions from local officials. If you live outside evacuation zones but near the coast, make sure you have enough supplies to last several days. Many locations may be without power or water for weeks.